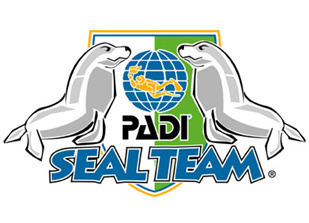 The PADI Seal Team is a fun and exciting course for young divers aged 8 and up to enjoy and learn about the underwater world through five action-packed Aquamissions. The Seal Team course aims to provide young divers the knowledge and skills to dive safely while still making it enjoyable and fun. This provides a great opportunity to introduce kids to scuba diving before the Open Water Course. This is done through five Aquamissions each with different skills to master. There is also a Crewpack that follows the course with games and puzzles to be completed that all relate each individual Aquamission. The essential skills they learn range from mask clearing to buoyancy exercises. The Seal Team Course is ran every one session per month on Tuesday night 6:00pm. We have spaces to start each month. To book please call or pop in the shop to reserve your place! Become a Master Seal and complete 10 extra Aquamissions ranging from night diving to underwater photography.